Now that its 2014, the humour is somewhat lost – it just sounds quaint. Nowadays, the main point that story serves to reveal is my age, but also, the enormous advances in mobile phone technology that have occurred in the relatively small span of history that has passed since I was in my late teens. True, it is possible that, with some really bad planning, one could still manage to arrive in a country area with poor telephone network coverage and not be able to get in contact with your host due to poor network coverage, but, assuming that about 90% of people carry a “smart” phone everywhere they go, a lot of other aspects of that story would be different in 2014. Sometimes I think that my generation (Gen X) are privileged to have a unique perspective on the ever-accelerating rate of advancements in technology, and not just because technology has advanced so much in our own lifetimes. Generationally, we are still have very close ties to a past where electronic devices of any sort were unheard of. My parents, perhaps a little older than average for my peers, were born before the Second World War, when a mechanical washing machine was still relatively new technology, and a telephone was not even yet a common household item for the average working class family. 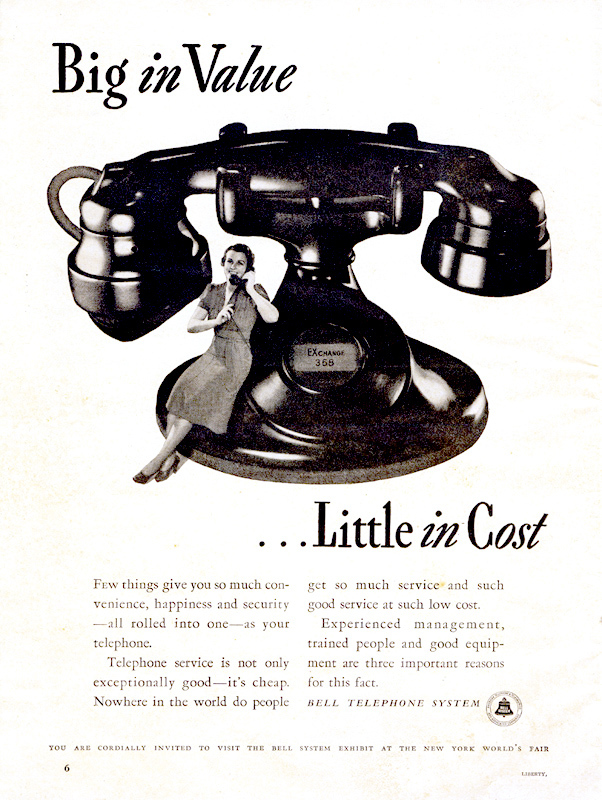 Bell Telephone ad (American) from 1938. Just lift the receiver and tell the operator the 3-digit number you need to call! I don’t remember my parents talking about any outings in cars as children so I’m not sure if my mother’s parents ever drove, or even owned a car. My father grew up on a farm, where a truck was certainly used for farming activities when he was older, but I know that as a small child, he walked with his older siblings the few miles from the farm into “town,” to get to school each morning, rain, hail, snow or sun, a journey that would probably take about 12 minutes by car. Those were the days when each child was given a “slate” and a pencil to write on it with, and children who were left-handed, like my father was, had their dominant hand tied behind their back until they learned to write with their right hand. 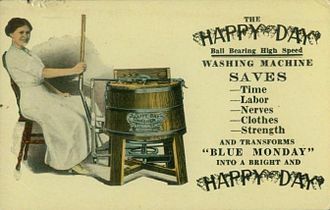 Washing Machine advert, circa. 1910. Saves Nerves. My grandparents’ lives began around the time that electric lighting first hit the streets of Melbourne, and that first flicker of yellow light seems symbolic, since the technology that electricity enabled would continue to advance – quietly for the first half of their lives, and, more noisily for the second half, when it would announce itself regularly with more and more new products that were increasingly able to be modified and priced for a domestic market. 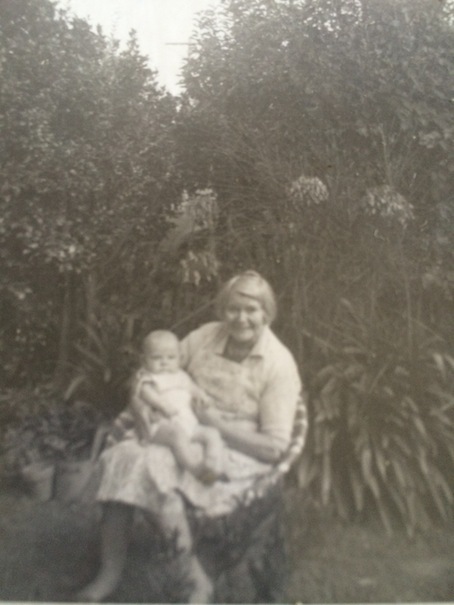 Consider the huge changes that occurred within my grandmother’s life: (1899 to 1989): her grandfather emigrated to Australia from Ireland, coming by boat, a journey of many months. When she was in her 30s, commercial flights began to operate in Australia – soon the same journey her grandfather had taken could be done in a day. When she was in her sixties, humans landed on the moon. When she was a young adult, people went to the “Pictures” to see a newsreel and a black-and-white, silent movie. When she was in her 50’s, television began mainstream broadcasting in Australia (1956), heralding the beginning of the Modern Era in Australia, ie, an era where the consumer market was dominated by electronic devices designed to make life easier, which had seemed like a futuristic vision only a few years earlier. Now you could watch the news in your own home, every night. As a child growing up in the 1970s and 1980s, I have vague memories of large black-and-white TVs, and the excitement with which we kids greeted the very first colour TV that entered our home, but by the time we finally got a “computer” (a monitor screen for an Atari computer game), I was studying for Year 12 and spent my free time at friend’s houses, so I was barely aware that this existed, and a video player never entered the house while I lived at home. Another thing about being a Generation X-er, or perhaps more specifically, through a combination of bad timing, and parents who were “old-fashioned” for the time, it seems that a Generation X-er like myself, who left home at the age of 18, was able to sneak through my teenage years and early twenties, barely encountering the technology that was finally, and gradually, becoming more widely used. As a student, I wrote all my essays through high school and my first university course with a pen and paper, which was still the accepted mode as recently as the early 1990s. Back up copy? No such thing. My only significant encounter with a computer in that time was when I took an optional, half-year subject in Year 10, imaginatively called “Computers”. This comprised of learning to turn a computer on and run through a basic typing course, in a pre-Windows environment of course, where we typed commands at the top of the black screen where a cursor flashed on and off. No wonder I wasn’t excited by the possibilities that computers had to offer. I seem to recall that some people my age had video players in their family homes by the time I was about 18, but we weren’t one of those families, and I left home before my parents finally relented on that front. Living for the next 9 years or so as a poor student in various rented share-houses, myself and my house-mates generally considered ourselves lucky to have a TV, (always donated by someone’s family), and I was probably about 27 before I ever had a video player in my home – just around the time that video was becoming old technology! Another way that my personal past is linked to the technology-laden present and future, is because popular culture in the 1970s was very obsessed with science fiction and a utopian future. There was a plethora of television shows screened in family-viewing time in the 1970s that were full of, or even based on, futuristic devices. From the videophone used by The Jetsons, to the talking computers and teleportation devices featured on Star Trek, to the robots that featured in everything from Star Wars to Get Smart, to the thrill of watching Rick Deckard (in a dystopian, early 80’s vision of the future) zoom in on a detail in a photograph in Blade Runner, as viewers we were excited by futuristic devices that seemed, to our eyes, to be creations straight out of the minds of screen writers with fantastic imaginations. In hindsight now, it seems that many of these writers were, if not actually aware of what would be possible in the future, at least riding on the Zeitgiest, creatively in tune with the potential that technology offered. An early prototype for Skype. 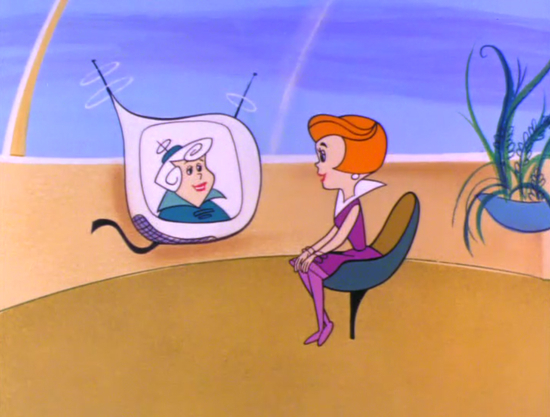 Nowadays, just like Jane Jetson, (perhaps less glamorously) I can call my sister in Ireland and see her face on a screen while we chat. Like Rick Deckard, I can look at a photograph and zoom in to scrutinise a detail. I don’t have a robot, but I believe Godfrey’s have a sale on them this weekend for $89. And, as Andy Warhol probably could have predicted, I can write a piece of “creative non-fiction” and in a matter of seconds I can publish it online where the entire online world could read it if they wanted to. I am frequently blown away by how fast technology seems to progress and often wonder what it would be like for someone from the 1930’s to go through a time warp. It blows my mind to think of what it would be like to see all the changes at once! I agree, that’s what motivated this post . I sometimes wonder what someone who stepped into the present from the past would make of certain devices, words or concepts that just didn’t exist in 1930 – or 1950, or in some cases, 2005! I grew up in the 70s and 80s too. We had no telephone in the house (that would be a “luxury”) and I too remember our first colour TV! Yes and you can now have a photo “frame” in your house with pictures changing in a continual slideshow, as Deckard did in Bladerunner. It sounds so mundane to even comment on that now. I always remember being amazed at that vision of the future of photography in that film – the ability to zoom in on photos and have them play on a slideshow in your home. Of course now, to a younger viewer (eg my daughter) they can enjoy the show/movie, but some of that thrill is lessened because things like the PADDs and the photographic devices don’t immediately signify THE FUTURE to them. PS yes I’m sure a few Apple engineers were inspired by Star Trek, and no doubt they’ve been working for some time now on the iTransporter. I just hope when they release it, it has the same connection for the charger as an iPhone 5, because it’s such a pain having to have multiple leads and chargers. Estragon: "Yes, now I remember, yesterday evening we spent blathering about nothing in particular. That’s been going on now for half a century." "I may not lead the most dramatic life, but in my brain it's War and Peace every day." Planning, you say? Why, I never thought of it! Blathering About Nothing delivered straight to your door! Hit me with the blathering!